Americans who have ever sat down for an authentic Korean meal will recognize kimchi as one of many small dishes served alongside the meal– slices of crunchy, cool cabbage, infused with chili paste, garlic, ginger, and a hint of anchovy or shrimp paste. LOWER EAST SIDE — A centuries-old Korean pickle is making its way into one of New York's most diverse neighborhoods, already steeped in age-old pickling traditions. November in Korea is the season for making paechu kimchi — a fermented and spiced cabbage that is a staple in all Korean meals, whether it's breakfast, lunch or dinner. And while it has been readily available in the authentic Korean restaurants and grocery stores of Manhattan's K-town, two Korean-American entrepreneurs see the allure of kimchi reaching all corners of the borough and beyond. Lauryn Chun, founder of Mother-in-Law's Kimchi, outside the Essex St. Market where her product is sold on Nov. 9, 2009. In early October, Lower East Side resident Lauryn Chun began to market a new line of Kimchi. Using her mother's recipe, she called her product MILKimchi (which stands for Mother-in-Law's Kimchi) and packaged the pungent leaves of cabbage in a Mason jar, a glass jar typically used in canning to preserve food in America. She debuted MILKimchi at the Lower East Side Pickle Festival, preparing 150 pounds of kimchi for the event. Every jar sold out that weekend, and the following week, the New York Times recommended her product on the Food page. With her business just a couple months old, Chun already has four retailers in New York carrying her product. Most recently, two Dean & Deluca locations signed up. "It's hard to imagine ethnic food as a product that could be found at a store like Dean and Deluca," Chun told DNAinfo. "A lot of people might think, 'It couldn't possibly be anywhere but Korean town. These are just old jars that stink up your fridge.'" "It's indicative of the cosmopolitan city that New York City is. This is a place that's receptive to things that are authentic and real and different." According to Korean custom, the mother of a bride-to-be tries to impress the intended groom with her culinary skills which have presumably, been passed onto her daughter. 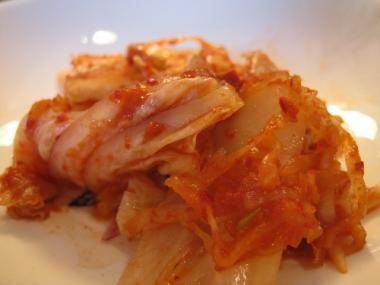 A woman's kimchi recipe is often a good test of her talents. In effect, kimchi is traditionally a measure of a woman's worth. So when Kheedim Oh, a Lower East Side DJ, founded Mama O's Premium Kimchi over a year ago, he had some explaining to do. "My folks live in Maryland, which is a couple hundred miles away," Oh said. "I got a craving for kimchi and I couldn't keep going back to their house. So I asked my Mom to teach me." 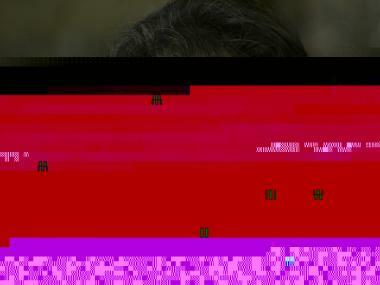 Oh said he often shared his mother's kimchi with his friends who suggested he try to make a business out of it. A chance conversation with his Essex St. Market butcher, Jeffrey Ruhalter, led to the birth of Mama O's, named in honor of Oh's mother. "I was buying some ribs from my butcher Jeffrey and he was telling me, 'If you have ribs and kimchi, you're eating like a king,'" Oh recalled. When he brought in a sample of his Mother's kimchi, Ruhalter was sold. Now, Mama O's kimchi is sold at five stores around New York City, including Jeffrey's at the Essex St. Market. Both Oh and Chun said their target consumers are not Korean-Americans but Americans. Chun, who was born in Seoul and raised in Los Angeles, likes to suggest non-traditional kimchi pairings, with wine, in spicy bloody marys and topped on rice cracker hors d'oeuvres with small slivers of bacon. Oh, who was born and raised in Maryland, says nothing beats a kimchi cheeseburger or a kimchi hot dog. 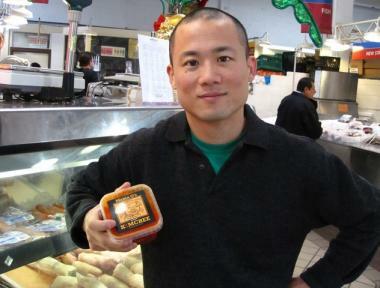 Kheedim Oh, founder of Mama O's Premium Kimchi, inside the Essex St. Market where his product is sold on Nov. 9, 2009. In Korea, the pungent cabbage is a national obsession, touted by Korean scientists and mothers as a super food, rich in Vitamins A, B and C, and “healthy bacteria” called lactobacilli, found in fermented foods like yogurt. This good bacteria helps with digestion. Some studies have even shown fermented cabbage may prevent the growth of cancer. It's also considered a palate cleanser, especially refreshing when downing greasy food. Koreans will tell you to take a bite of kimchi when you're tired of eating. The chili paste will lightly sting your tongue, and soon, they say, you will feel refreshed and ready to start eating again. Nancy Ralph, a pickle expert and director of the New York Food Museum, said she has noticed kimchi and Korean food growing in popularity these last few years. "Korean food is coming," Ralph said. "I do think it has become mainstream. I think the city goes through evolutions of food trends. We've seen quite a few Korean restaurants open up in the Lower East Side." But Ralph said it would be extremely hard for the entrepreneurs to compete with the local kimchi sold in supermarkets, many of which are manufactured in large factories in Queens or Long Island. Chun and Oh both agree. But they hope their products' homemade taste will set them apart from the "mass produced" kimchi products out there. "It's a lot of work," said Oh, who described spending hours cutting cabbage in his commercial kitchen in Brooklyn, dicing garlic, grinding chili powder and rubbing the cabbage leaves with the red, pungent paste. "It's a 100 percent handmade, with tons of T-L-C," said Oh, who is already thinking up his next pickle venture — kosher kimchi.